Blues Brothers Soul Band Rhythm and Blues Tribute is a high-kicking, ball-busting, hard-rocking, nail-biting, cat-fighting, film-faking, tight-fitting, feet-stomping, dance-crazed, alcohol-hazed, powerhouse performance of a show. 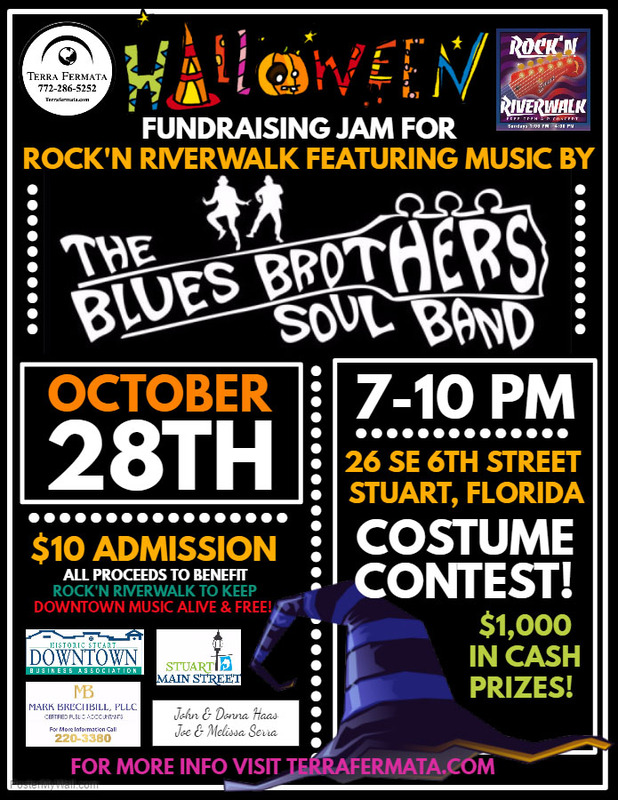 In conjunction with tonight’s show and in partnership with Stuart Main Street, the Downtown Business Association, and Mark Brechbill PLLC; Terra Fermata is hosting a fundraising event to keep Martin County’s beloved Rock’n Riverwalk concert series going for years to come! Rock’n Riverwalk is a free, outdoor concert series which takes place at the Riverwalk Stage in downtown Stuart every Sunday from 1:00-4:00 p.m. In the spirit of Halloween, tonight’s event will feature a costume contest sponsored by Morgan Stanley. Winners of the contest will be awarded $200. Bonus! Best Overall will also receive free concert tickets to a Terra Fermata show. For more information about Rock’n Riverwalk visit facebook.com/RocknRiverwalk.